When I think of Summer I immediately think of the beach. There is something so lovely about the sea air, sand between your toes and padding in the waves. Our favourite beach is Holkham in Norfolk as even when it's busy it feels really quiet and it's so beautiful. 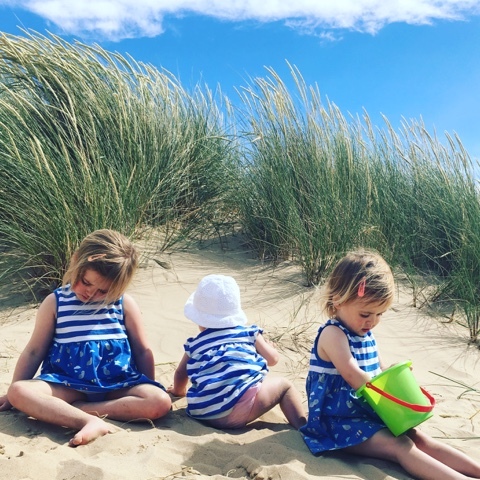 It's a simple day out and the girls will spend hours building sandcastles and collecting shells. We always like to finish a beach day with fish and chips as they always taste so much better when eaten at the seaside! 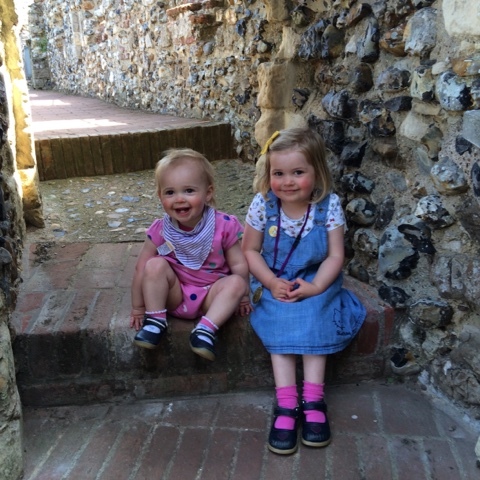 We love visiting our local woodland for a walk, some shade and an explore on warm days. There's also a play area, kids activity trail and cafe at the one we visit. Check out the Forestry Commission to find a wood near you. The girls love following the paths, climbing trees and picking up sticks. 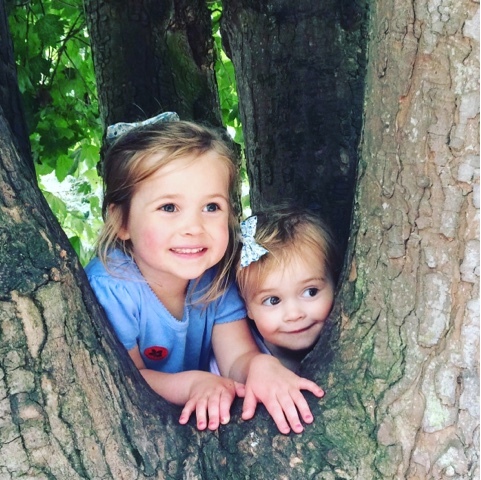 Ellie and Phoebe hiding in a tree! We are lucky to have several amazing country parks nearby all with different things to offer, from wonderful adventure playgrounds, to water gardens you can splash in, to feeding the ducks and excellent cake in the cafes. Best of all they are mostly free apart from parking charges. 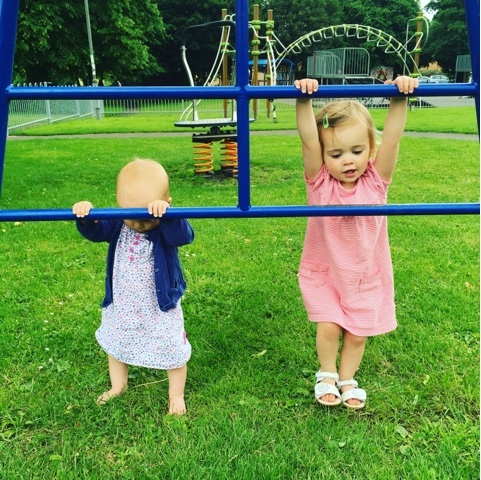 We also have a playground in walking distance and if in doubt we often head down there with a blanket and a picnic and the girls can run off some energy. Our National Trust membership paid for itself very quickly and it's fantastic when we're looking for something to do. Our favourites are Belton House, the Wimpole Estate and Lyveden New Bield. We'll visit all of these over the summer along with hopefully some new ones, I'd love to take the little ladies to Stowe and Anglesey Abbey. The National Trust have a fantastic booklet which you can pick up at any of their sites called 50 things to do before you're 11 3/4 with lots of ideas inside. 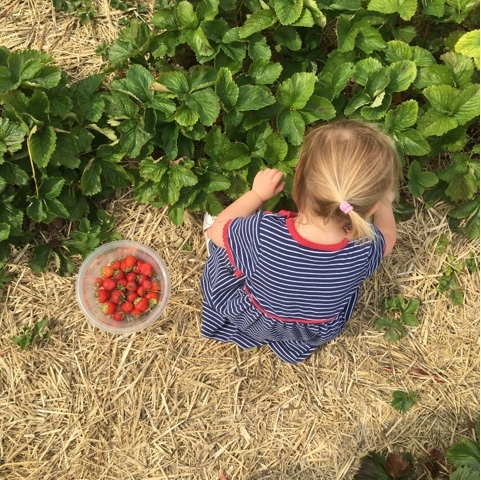 This is such simple fun and the little ladies love it, we give them a punnet and off they go. I love that it teaches them about where food comes from and that they are in the fresh air and how keen they are to eat their pickings. It's really affordable too costing just the price of the fruit you pick. 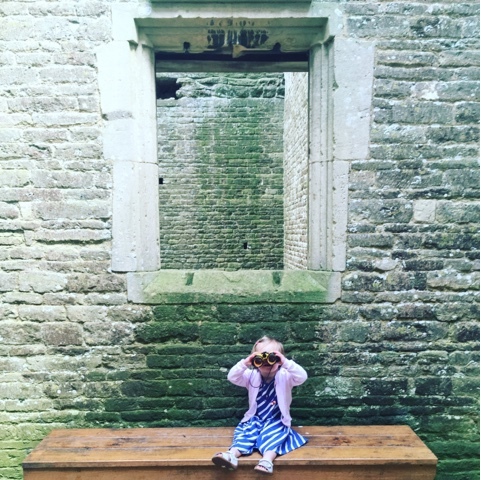 There's something really magical about visiting a castle, they really set the girl's imaginations running as they pretend to be princesses or knights. The sheer size of them is mesmerising and there is just so much to explore providing a whole day out. It's really exciting climbing the steps from the keep or looking out at the landscape from the tower windows and learning about the people who used to live in them. The girls are little water babies and love swimming, they will happily splash around for hours. 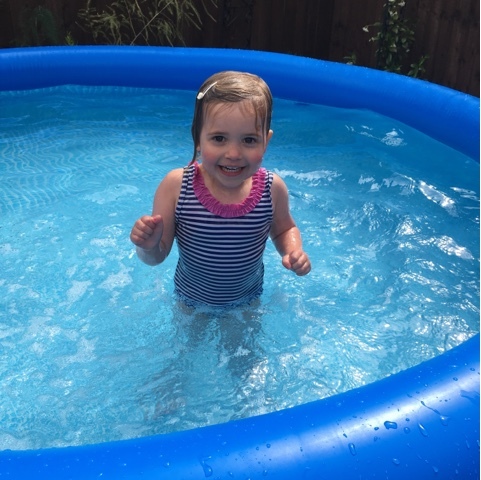 Our local pool has a wonderful toddler area with slides and bubbles and a paddling area so we'll definitely be visiting the pool along with lots of paddling pool days in the garden. We like to save this one for one of the inevitable grey, rainy days when a trip to the cinema is the perfect treat. Many cinemas do a pocket money showing on weekend mornings and during the school holidays. Our local cinema shows a different children's film each week at 10:15am every day for just £1.50 per person which is just fantastic value. 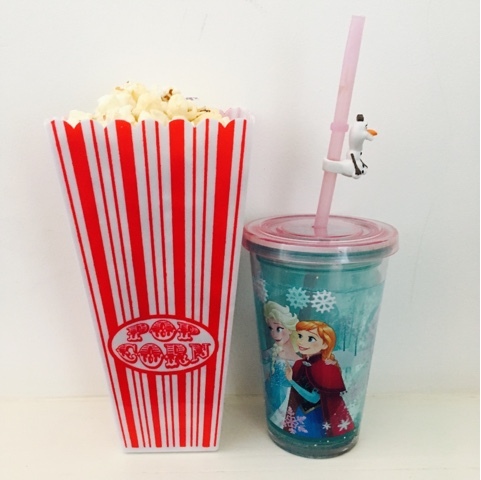 Odeon Kids is just £2.50 per person and they're showing some great films this summer. 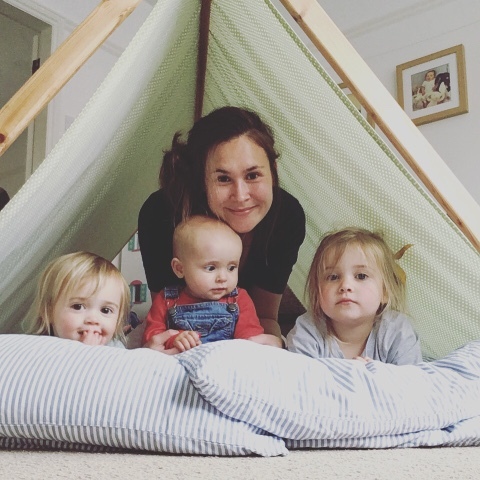 There's a lot to be said for planned in home days and lazy mornings in the school holidays. Movie afternoons where you close the curtains and make popcorn are just the best, baking cakes or biscuits is a firm favourite in our house along with, colouring, sitting and building lego, making story baskets of our favourite books, playing in the sandpit, with the paddling pool and water table. Whatever they like doing - a mix of free play, downtime and some structured activities work best for us. 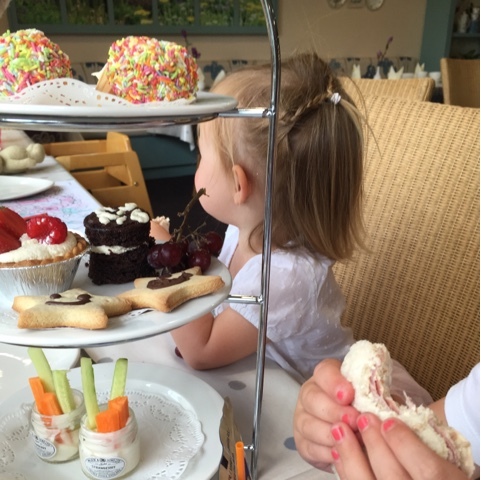 Dobbies Garden Centres do a very sweet children's afternoon tea for a modest £4.95 per child. I think it's really fun and such a special treat. 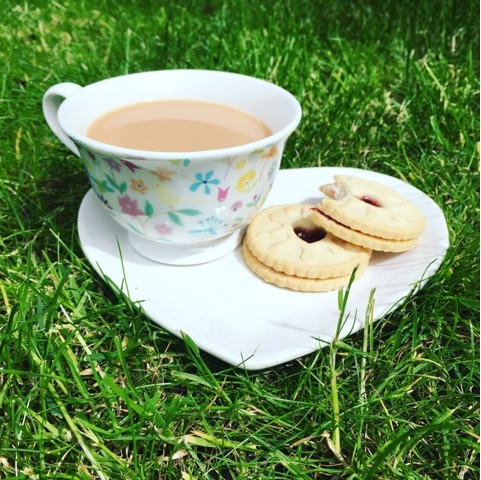 We put it to the test and the little ladies loved their flower shaped sandwiches, cakes, biscuits and ice cream, Phoebe even had decaf tea in a china cup. The little ladies love nothing more than walking with their dolls in pushchairs or scooting into town for a milkshake or ice cream at our favourite cafe. It's such a special treat and they literally jump for joy when we suggest it and it can really break up long days. Like most children, the little ladies love animals so a visit to the zoo is definitely on the cards. It's great fun as well as educational and everyone gets something out of it. 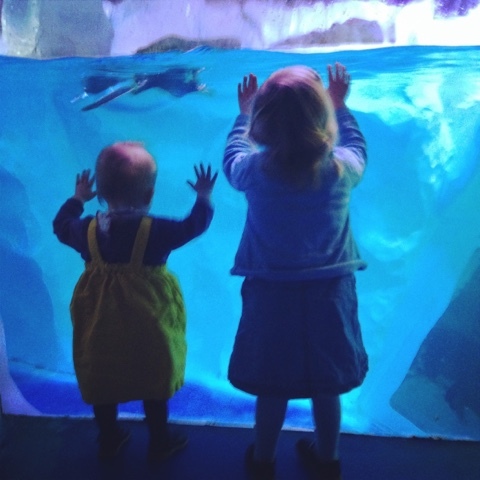 If you shop with Tesco you can swap your clubcard points for tickets to several zoos across the UK (or other days out) which can make an otherwise pricey day a very affordable one. 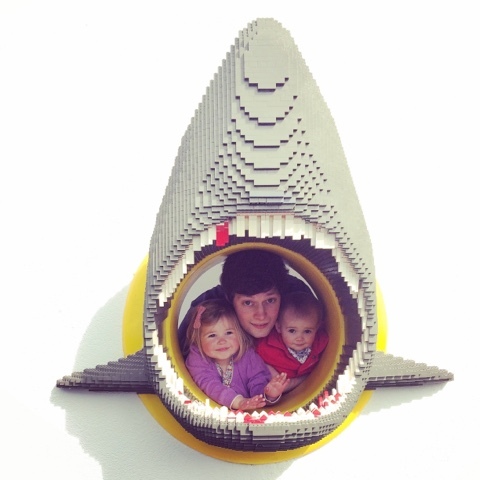 Last year we went to Legoland in Windsor and it was all kinds of amazing. We've also visited Peppa Pig World in the past which was also fantastic. 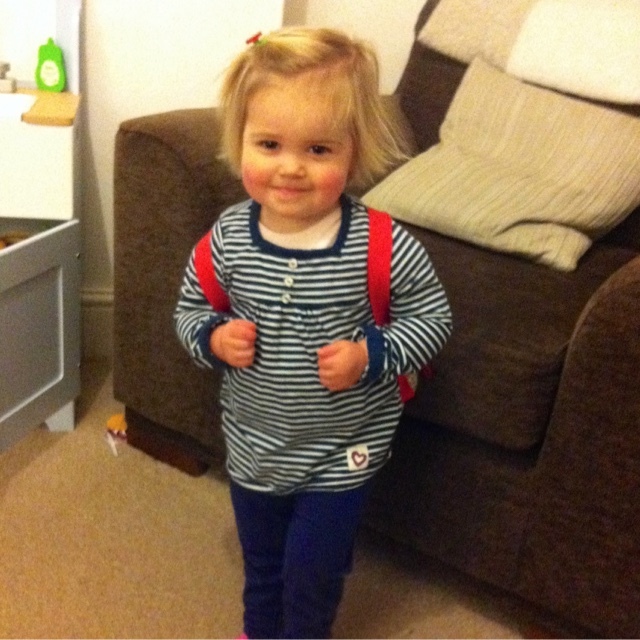 This summer CBeebies Land at Alton Towers is on our radar before Ellie gets too old for it. 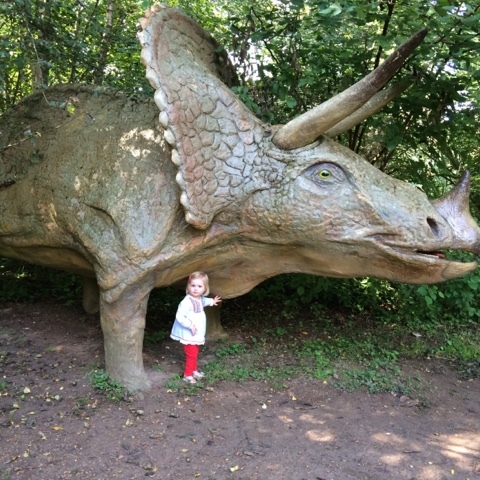 We went to Dinosaur Adventure when Ellie was two and she still remembers it. We'd love to go back as there is so much to do there and we know the little ladies would love it. There is are several brilliant play areas, a dinosaur trail, a farm and a new water play area. 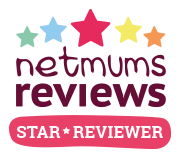 This is another place which accepts Tesco Clubcard Vouchers which is just fab. We love having our friends to play, last year we created a playroom in what was Daddy's office and there's lots of fun to be had in there with friends. 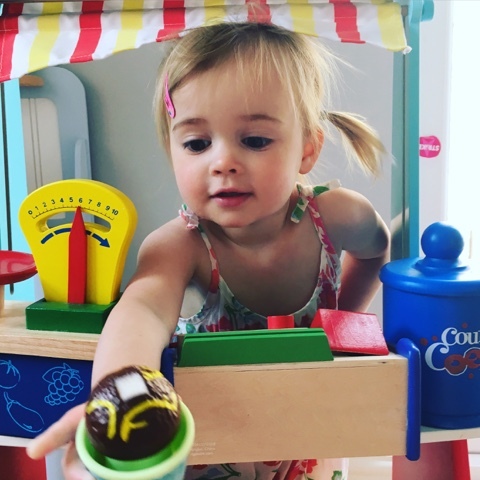 Things like our play shop and play kitchen and colouring area get well used during play dates as do the big boxes of duplo and plastic animals. It's lovely for me too as I get to see a friend too and drink tea and eat cake. London is such an exciting place to visit with so much to see and do - the girls love the train journey too. 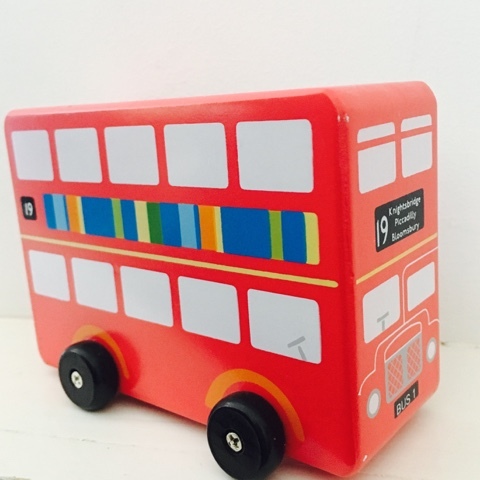 On our London to do list this year are: The Natural History Museum, The Princess Diana Memorial Garden in Hyde Park (both free) and then dinner at Rainforest Cafe or Disney Cafe in Harrods. We'd also love to take the girls to see a matinee show in the West End. 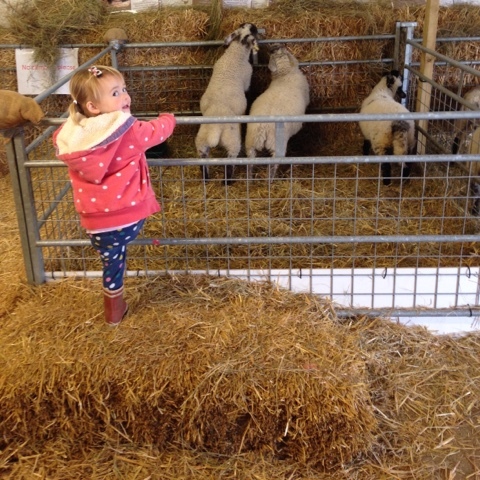 The little ladies love going to the farm and seeing all the animals, they all have their favourites and it really wears them out as they walk around the farm and play in the play area at our local one. I like that it's fun and educational for them and that they're in the fresh air. 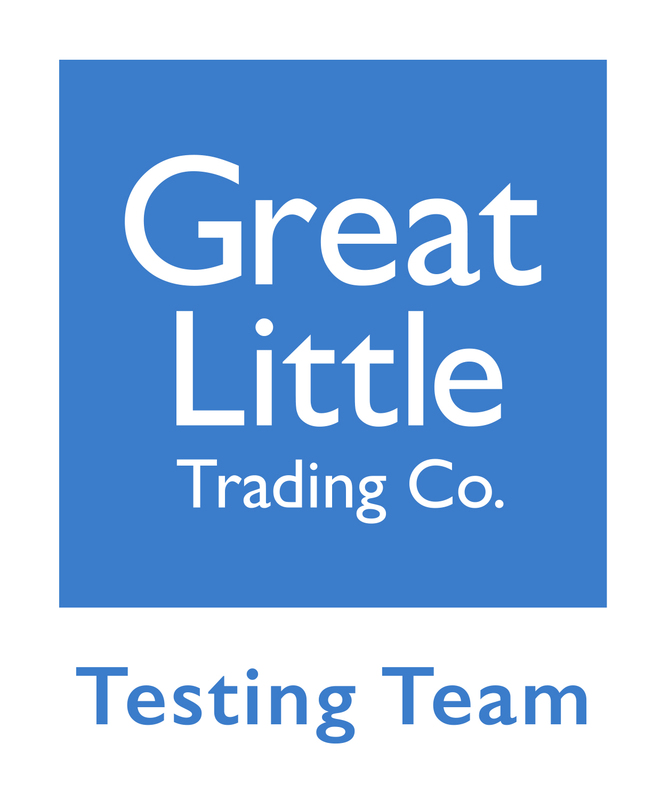 I hope you have a fantastic summer with your littles whatever you are up to. You can keep up to date with our adventures over on my Instagram and i'll be popping some reviews up on the blog of the places we visit over the course of the summer. 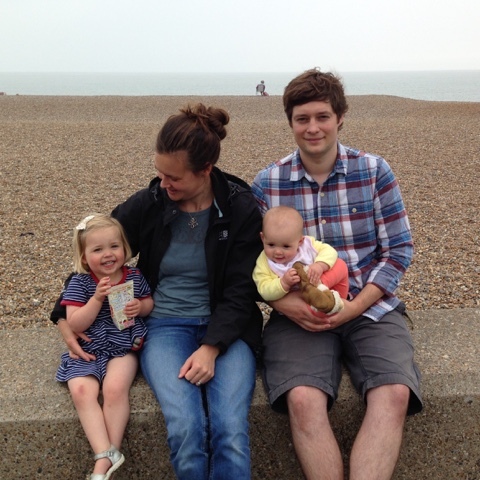 If there's somewhere you love and would recommend to other families do let me know in the comments below. Wednesday was Miss Boo's last day at playschool, it feels like a big day in the life of a little and also as a Mother so I've decided to document it. 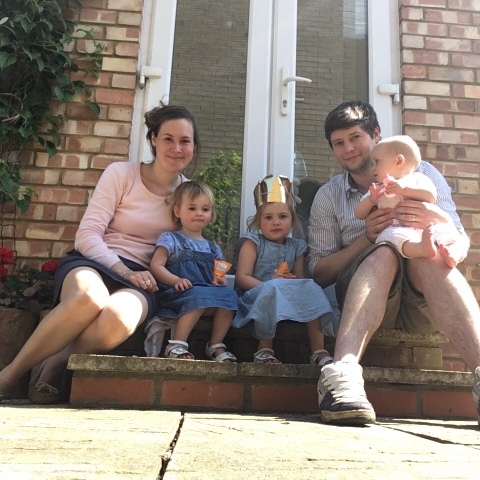 Since January when Miss Tibs started playschool I have taken a photo of them together every Monday morning on our doorstep. As I took their picture I got a lump in my throat as I realised this was the last time they would share this kind of time together for a while, until the school holidays or when Miss Tibs joins her in 2 years. Miss Boo has helped her little sister settle in so well and given her such confidence, they love being together and are the best of friends (most of the time). 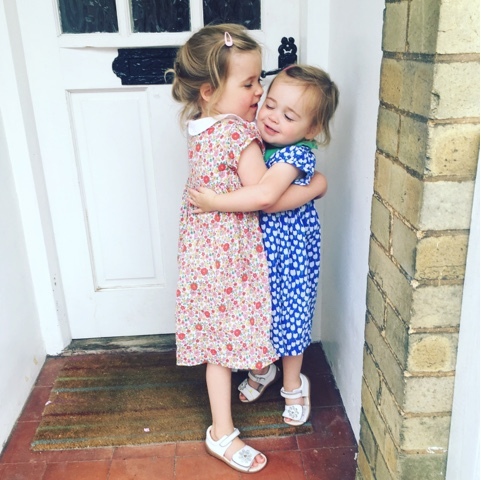 They were both so excited to go to the end of term party with all their friends but as I drove home I couldn't help but cry with feeling just a bit overwhelmed that this little chapter was coming to an end for Miss Boo and rather selfishly, for me too. I've been at home with her for 4.5 years now and it feels monumental that she's heading off to school in 6 weeks time. It also hit me that she's no longer a preschooler but a little girl and I hadn't noticed the change in her until I looked through her key file of all the photos of when she started aged just 2. 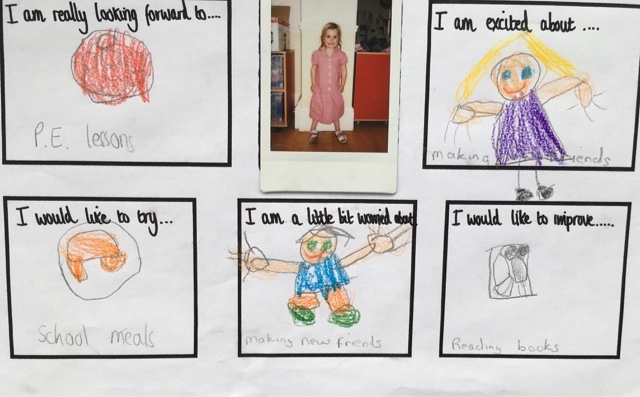 I've tried to talk to her lots about going to school and whether she has any questions or worries and what she is looking forward to and she has seemed pretty non plussed about the whole thing. To see that she is excited to make new friends but also worried about making new friends makes my heart hurt a little bit, as long as she stays true to herself and sticks to our family motto of being 'kind and gentle' then I know she'll be just fine. 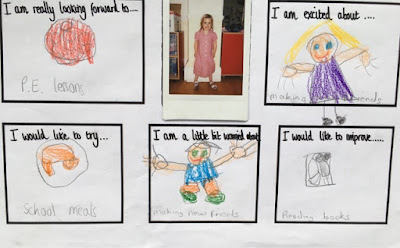 She's so intrigued by PE and school dinners, it really made me smile that she put these as things she is looking forward to - I hope she's not disappointed (I was never a fan of either!). Most of all I love that's she's inherited my love of books and that she is thirsty to read and I can't wait for when she inevitably sits and reads her little sisters a bedtime story in the not to distant future. We had to choose a book for her as a commemorative leaving present from the playschool and chose "The book with no pictures" which is all about words and how clever they are. When she opened it she was confused as to why there were no pictures but when I read it to her she listened so intently and laughed and asked me what the words said, it was the perfect book for her as she starts the next part of her journey. 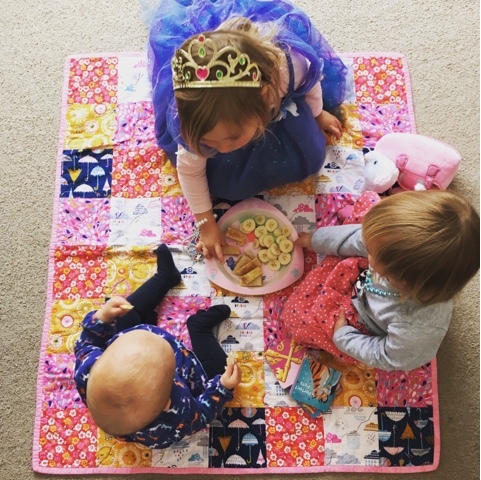 So that's it, no more playschool for Miss Boo and kind of the end of an era for me in that I won't have 3 little ladies at home for the most part with me any more. I'm going to make this a summer for us all to remember, we'll have lots adventures together and lots of long lazy mornings eating pancakes in our pjs too before we are tied into 9-3, Monday to Friday school days and then we'll count down until the weekend and then half term when my sisters can be a three all day long. While Miss Boo is having a wonderful time learning about the world at school I will make sure i have lots of quality time with Miss Tibs and Miss Dot so that they can follow (although not too quickly) in her lovely, confident, independent footsteps. sunny days which are so enjoyable and you're so glad you hopped aboard. Then there are the days when the cabin fever really sets in and you just want to get off... Except you're running out of fuel and there's no sign of land nearby. You consider momentarily jumping ship but there are no lifejackets and the water is shark infested. You'll have to wait, your passengers need you. 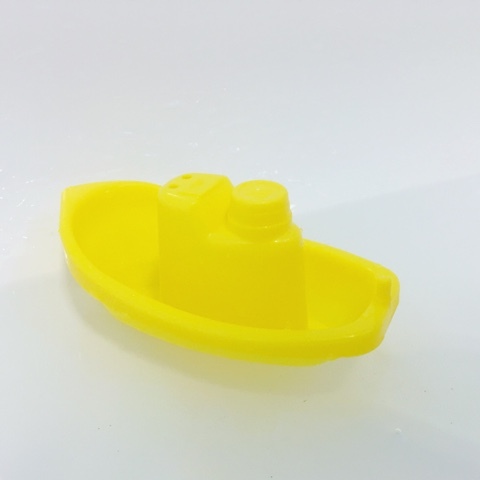 Time to find a lifeboat and send out an s.o.s. This is the kind of day I've had today and it's the worst feeling. 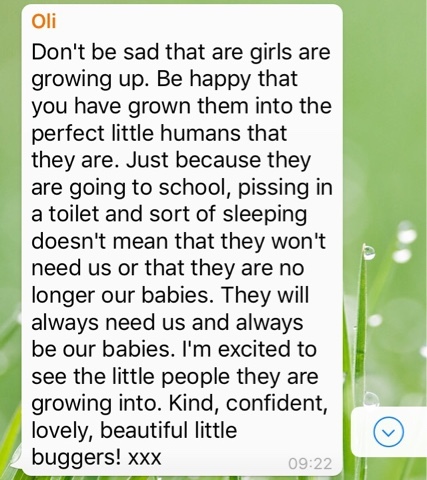 The little ladies have cried back to back ALL DAY. Miss Dot kindly woke everyone up at 5am so they're overtired and very grumpy. They are fighting continually, point blank refusing to nap and no matter what I do I just can't appease them or distract them. The mothership has been invaded by pirates and I just want to get off; it feels like it's sinking fast. 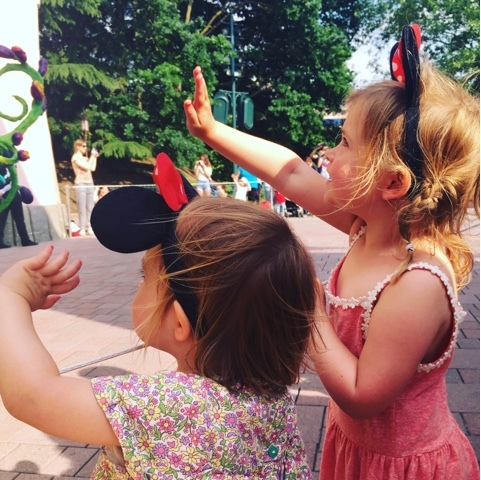 We have recently returned from 6 absolutely magical days in Disneyland Paris with our 4, 2 and 10 month old girls. I wanted to blog about our trip not only to capture the many memories we made while they are still fresh in my mind; but also to share our experience and tips on visiting this special place with young children. 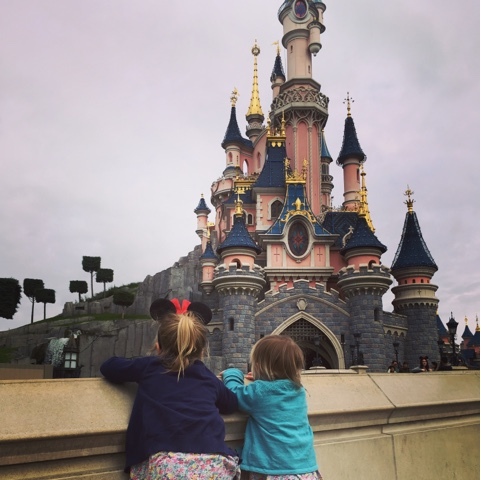 I've put together some top tips which we found really helpful and made our first experience of Disneyland Paris a brilliant one. 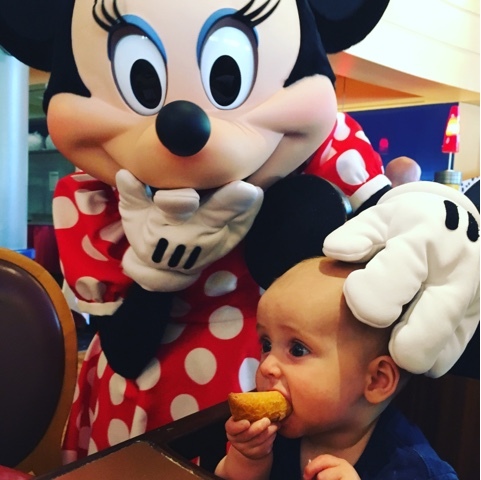 We booked our trip with Disneyland Paris directly to make the most of an offer they had on giving us 2 extra nights and 2 extra days free with free entry into the park for children under 7. Having originally thought we would go for 3 nights, 4 days this took us to 5 nights, 6 days at the Wild West themed Hotel Cheyenne which was about a 15 minute walk from the parks and a 10 minute walk to the Disney village. We stayed in one of the newly decorated Texas Rooms which are Toy Story themed and provided a perfect base for our stay. We opted to travel by Eurostar rather than flying as we are less than an hour by train to London and connecting to the Eurostar from Kings Cross is super easy. It's worth knowing that you can get significantly reduced fares on your train travel to Kings Cross St Pancras if traveling by Eurostar to Paris by contacting Eurostar Domestic Travel on 01233 617 913. Booking our Eurostar as part of a package with Disneyland Paris gave us Disney Express Tickets which meant that when the train arrived at Disneyland Paris with three (ok two) very excited little ladies we could go straight into the park and having dropped our bags at the designated point at the station they were taken straight to our hotel and the magic could begin straight away. I'd really recommend buying some Disney treats before you go as everything is very expensive when you are there. We spent a few weeks collecting bits and bobs to give the girls on the train to keep them busy. They were so happy with them and they definitely kept them busy as well as hopefully making the journey feel as special as we knew the trip would be. 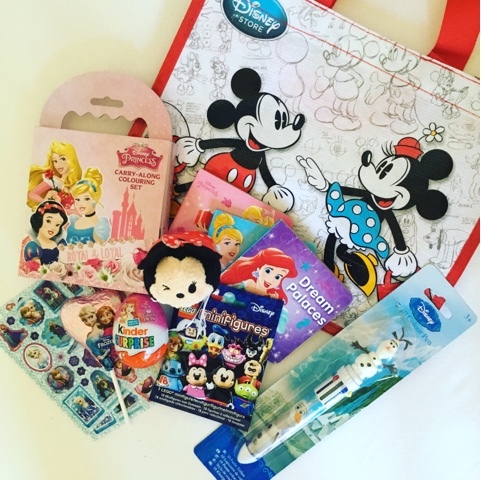 They included a travel sized Disney princess colouring pad and crayons, a minnie tsum tsum, stickers, a Disney lego mini figure, a frozen themed chocolate lollipop, a disney kinder egg, some mini princess travel books and an olaf pen. Most of this was sourced from eBay and supermarkets. We also got the girls some minnie ear headbands for less than £2 each from eBay before we went which they didn't take off the whole time we were there, they were about 13 euros each in the parks so I was really pleased we had pre purchased some as the girls were too little to tell the difference. 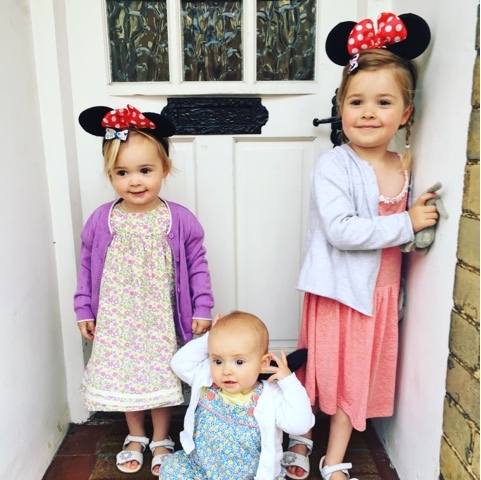 Just about to leave in their Minnie Ears! We packed some of the girl's princess dresses so they could wear them there. 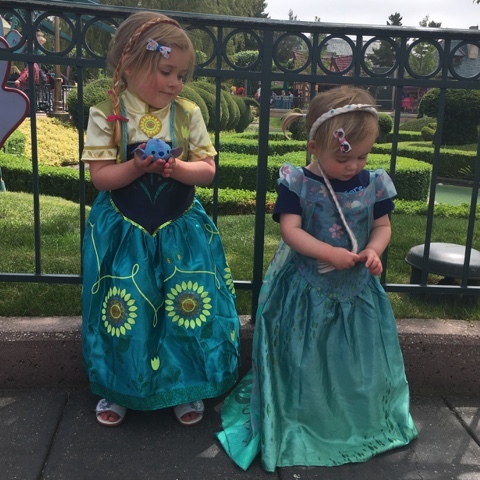 It was wonderful watching them skip through Disneyland in their Elsa and Anna dresses, they really felt like real princesses. They wore them to the frozen sing along show and because they were dressed as princesses we were given seats a in special princess area of the theatre which the little ladies just loved. It's so nice for them to be able to wear the outfits when they watch the parade too or when they meet their favourite characters at meet and greets or character dining experiences. Again they are expensive to buy there so worth taking with you if your children like this kind of thing. I would also recommend taking lots of snacks as food is expensive to buy in the parks and healthy food is also tricky to come by. I took a whole bag filled with things like dried fruit to nibble on and some mini packets of biscuits, crackers and crisps which kept the little ladies busy while in queues. I also packed some large zip lock bags and at breakfast time popped what the little ladies hadn't eaten into one of these bags and they had breakfast on the go later or ate it for lunch. It was a continental style buffet breakfast with croissants, ham, cheese and little french rolls. It seemed a shame for it to go in the bin and the girls ate very little of what we made them at breakfast time as it was quite busy and overwhelming in the buffet hall, i'd say this saved us about £30 a day, as we didn't need to buy lunch. 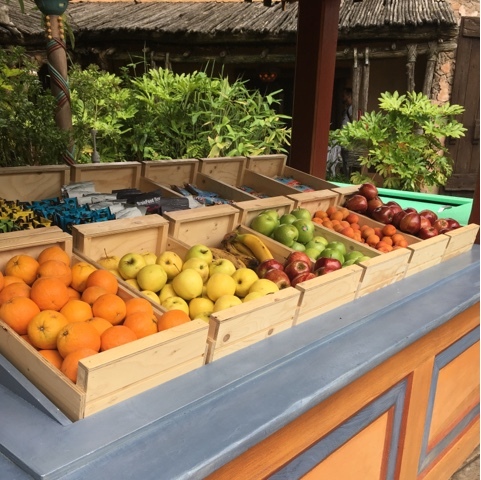 Fruit is quite hard to find in the park but I did find a stall selling it in Adventureland near to the Aladdin meet and greet area which sold apples and bananas and another just inside the Walt Disney Studios one afternoon. They were 1.50 euros but Phoebe kept asking me for fruit and they were devoured so we happily paid this. On the subject of food i'd definitely research and plan how you're going to eat while you're there. 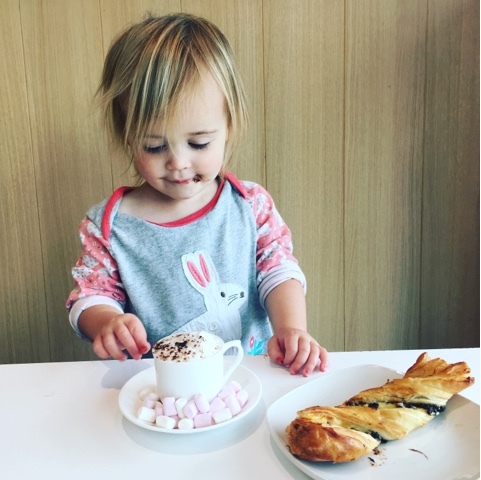 It is absolutely worth booking some if not all of your restaurants in advance, firstly to guarantee a reservation as the popular ones get booked up quickly, particularly around normal childrens mealtimes. 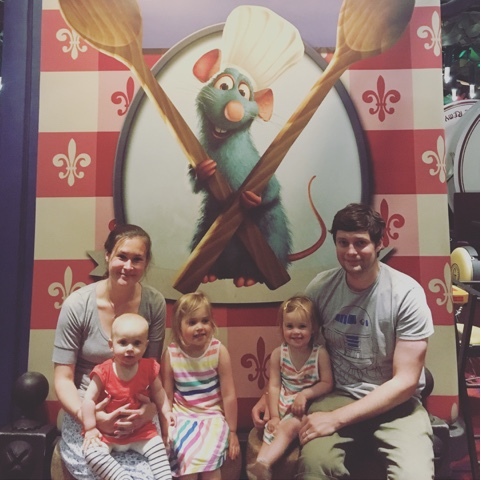 We booked Cafe Mickey and the ratatouille restaurant Chez Remy about 2 weeks before we went as we knew these were definitely places we wanted to eat. Both were fantastic experiences and we all really enjoyed it, the food although at a premium was very good. Meeting the characters as we ate in Cafe Mickey was brilliant and the girls loved it. Our favourite meal was definitely in Chez Remy and felt like a well deserved treat after a busy day in the park. We also ate at the rainforest cafe in the Disney Village which again was a wonderful experience with good food. I think expecting food to be expensive and budgeting for it and planning where you want to eat in advance really helped. We also ate a buffet style meal at our hotel one evening and then had some cheaper more snacky meals at the Earl of Sandwich and Mcdonalds. Before we went I spent a long time reading about all the restaurants and viewing sample menus on an independent website called www.dlpguide.com: it was so useful and gave me a good overview. We didn't book a meal plan as 2 of our children were under 3 and the children's menu starts from age 3 upwards. We were able to order just one child's set menu and split it between all 3 girls as the portions are generous and they also shared from our plates. The staff happily offered extra plates for our two youngest. I think if we revisit when all three girls are older a dining plan may work out better value as you can use your dining plan vouchers in all the restaurants and top up with cash if the cost of your meal exceeds your dining plan allowance. I really recommend doing as much research as you can before you go and putting together a loose itinerary as it will make your trip so much more enjoyable and you'll have more time to have fun rather than trying to figure everything out when you are there. 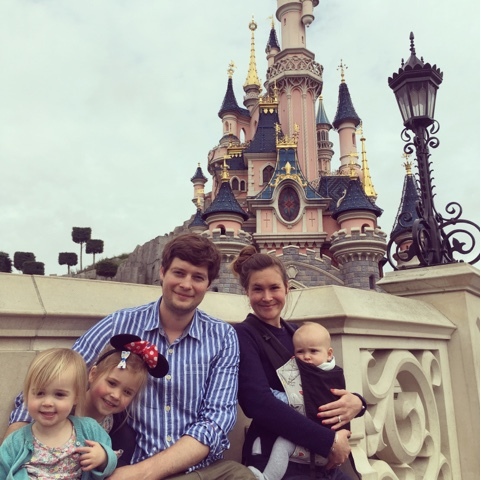 I read a lot of other blogs and watched a lot of vlogs before I went which were full of handy hints and tips and nuggets of golden Disney knowledge, one of my favourites is the Trip Advisor Disneyland Paris Forum. There is just so much to see and do with lots of shows, meet and greets and parades etc you could easily miss if you don't plan. Obviously make it something that is flexible as it's all about having fun here! Another top tip is to get hold of the the most up to date show and parade programme which you can find on the Disneyland Paris website, it does change regularly so worth checking before you go. You can also pick these up along with park maps as you go into the park but who wants to be studying schedules when there are rides to go on! I also downloaded the official Disneyland Paris mobile App which includes a map with current queue times which was really helpful, particularly for things like the very popular princess pavilion when you can meet a princess. If you have small children i'd advise taking anything with you that will make your day as easy as possible and a pushchair is an absolute must. 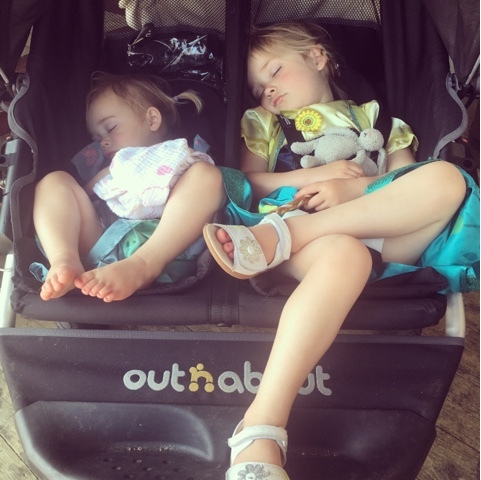 It's so tiring spending a whole day in the park as an adult and a long walk back to the hotels so I can only imagine what it would have been like for our little ladies if we hadn't had our fabulous Out n About Double Nipper with us. The girls sat and napped in it when they were tired or if it was really busy and we needed to keep them together in a crowd. It was also great for popping coats and other bits and bobs in that we would otherwise have had to carry. I also took a sling for the baby which meant she could see what was going on and also freed up a space in the pushchair, pac a macs for the forecast showers we had while there and water bottles to fill up. There are water fountains outside all of the toilets, we didn't buy any drinks at all while we were there apart from at dinner time. The parade is amazing, we watched it twice once on main street which had a great atmosphere but was very busy and once by the turrets in Fantasyland just down from Pizzeria Bella Notte. The latter was our favourite spot as it was close to the start and meant once the last float had come by we could go on some rides or queue for the Princess Pavillion while most other people were still watching the parade. The fireworks are just spectacular. They are on late (park closing time) but worth keeping the children up for just once, our little ladies couldn't believe their eyes and thought it was literally magic. A late afternoon nap and a slow morning the next day and you're good to go. Meeting characters was a highlight of the trip for the little ladies, they got so excited and were over the moon to have a cuddle, picture and ask them to write in their autograph book. It's worth leaving a blank page next to each signature so you can print out and stick in the co-ordinating photos when you get home. Character dining was a brilliant way to meet lots of characters in a short space of time. Our favourite rides were the teacups and its a small world in Fantasyland, and the Ratatouille ride in the Walt Disney Studios park is amazing and well worth the long queues or getting to the park early for and snapping up a fast pass which gives you an allotted time to ride. It sounds so cliched but we had the most magical week, the little ladies absolutely adored it and so did we. We spent quite a lot of the holiday trying not to cry at their wonder at everything and at their pure joy on the rides and everything they saw. The moment you first walk into the park and they see that iconic castle is indescribable and super special. 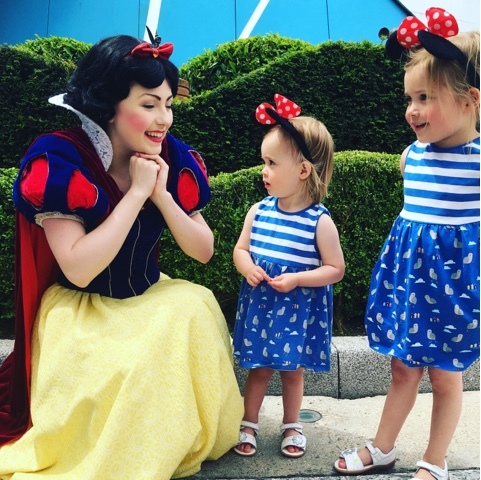 The looks on their faces as they meet a princess or cuddle Minnie Mouse are almost impossible to capture. My final tip is simply to take lots of photos, drink it all in, and make some beautiful memories with your family, it's a holiday you will never forget. If you have visited Disneyland Paris and have any other tips please do leave them for readers in the comments below. Thank you.